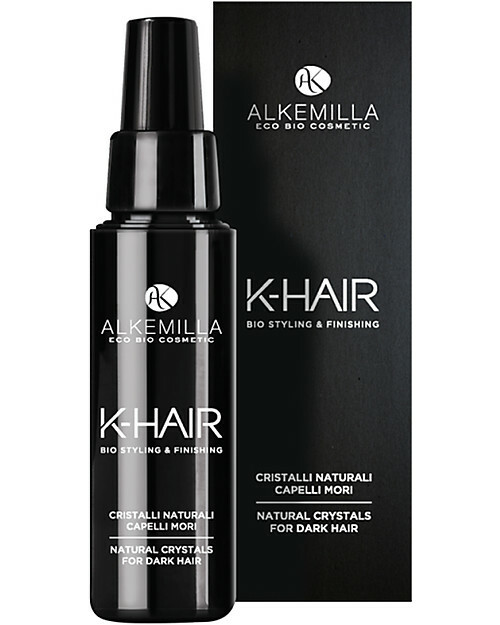 Use natural liquid crystals of the K-Hair line by the Italian brand Alkemilla for a shining effect! A shine and moisturize effect, thanks to the extracts of Linen, Almond, Oat, Meal and Sunflower. It nourishes deeply through the Soya aminoacids, combined with the Hyaluronic acid and the vitamin E influenced by a strong anti-free radical action. Hair will remain light, wound in microfilm to protect against the atmospheric agents. K-HAIR Bio Styling and Finishing Line is composed only of raw materials of the highest quality that in addition to giving a perfect result, nourish and moisturize in depth. Advanced formulas to give the hair the best result without renouncing the safety of an organic product, certified and not tested on animals. Alkemilla is an Italian brand engaged in the production of organic cosmetics with the aim of offering safe and guaranteed products that respect the environment and the animals. ECO bio cosmetics AIAB certification: all the products contain 95% of ingredients of plant origin, a percentage of ingredients from organic farming and very high biodegradability.